A Chinese-led consortium has won an uncontested contract for a multi-billion dollar high-speed passenger rail link between Mexico City and the central city of Queretaro, the Mexican Transport and Communications Ministry said on Monday. The group led by China Railway Construction Corp Ltd was the only bidder for the 210-km (130-mile) line, despite earlier interest from rivals like German conglomerate Siemens and Canada’s Bombardier. Under President Enrique Pena Nieto, Mexico has sought to forge closer business ties with China, while the world’s No 2 economy has been looking to export more of its high-speed rail technology. The Export-Import Bank of China (EximBank) will finance 85 percent of the project’s costs, the ministry said. Mexico’s government said on Monday the project would cost 50.82 billion pesos ($3.74 billion), including the build cost and five years of operation. The figure will be updated later to reflect inflation, exchange rates and other variables when the contract is signed, the government said. That is less than the 58.95 billion pesos the consortium quoted for the deal, according to a China Railway Construction Corp statement earlier on Monday. The company said it will undertake work worth 38.96 billion pesos, around two-thirds of the total. A Mexican transport ministry spokesman said that the government figure excludes value-added tax, which eventually is returned to the government anyway. 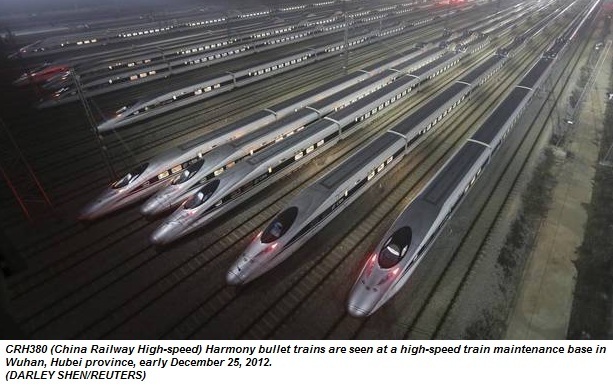 Mexico wants the project to allow 27,000 passengers to move daily from Queretaro at speeds of as fast as 300 km/h (186 mph). Siemens’ Mexico rail chief told Reuters last month that the company, along with Bombardier and France’s Alstom PA, had asked for more time to prepare a bid, a request denied by the transport ministry.